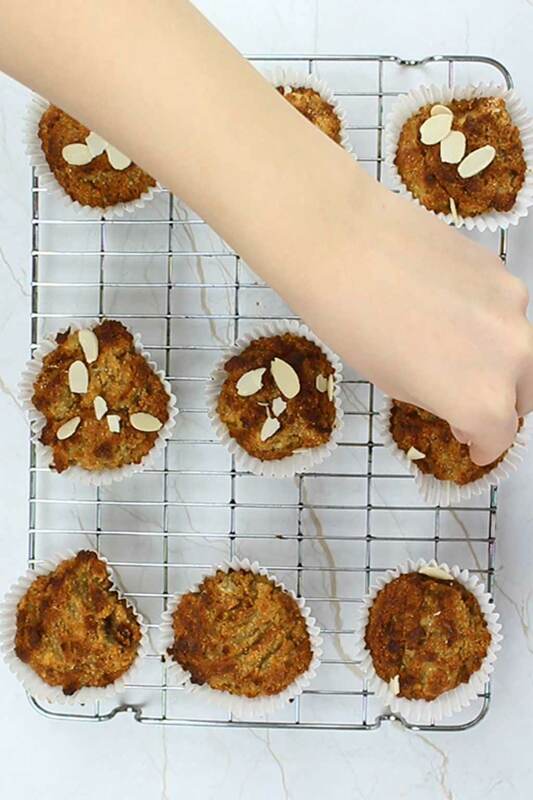 These super moist almond flour banana muffins with apple sauce are so easy and healthy! 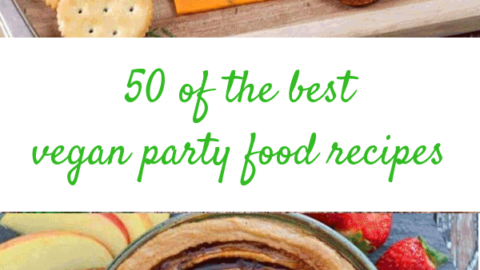 They’re naturally sweetened, vegan, gluten-free and oil-free too! Does anyone else find it extremely difficult to find a good muffin that isn’t filled with processed sugar and refined flours? 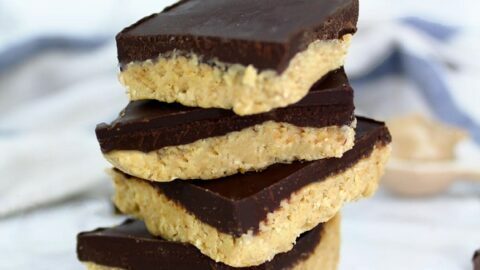 As much as I love baking indulgent desserts, it’s nice to make healthy treats once in a while. 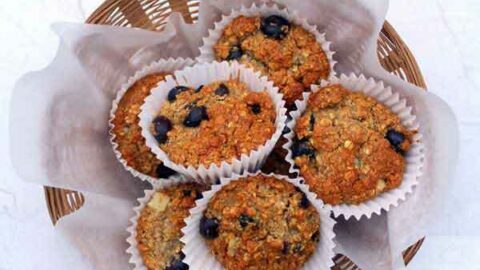 I’ve tried and tested many different variations of healthy muffins in the past such as my healthy blueberry muffins and healthy chocolate chip muffins. 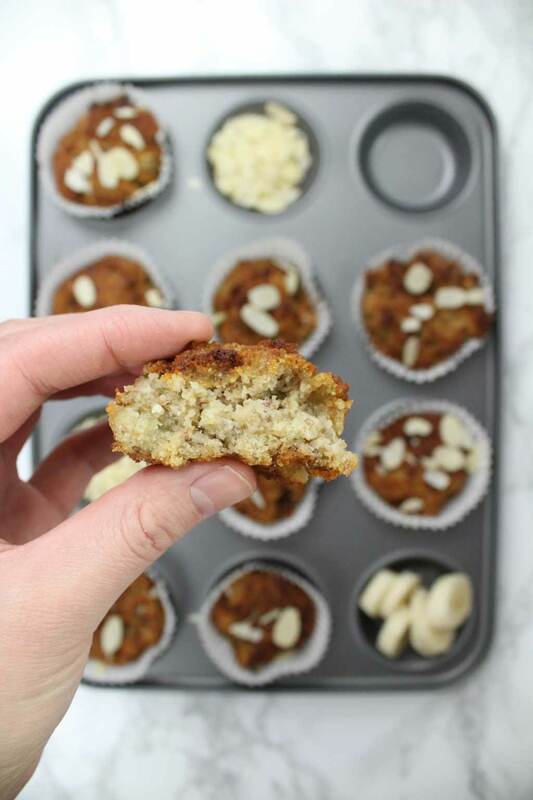 But these almond flour banana muffins are by far my favourite! Granted, these might not be the prettiest muffins you’ll ever see, but they taste absolutely incredible! They are suuuuper moist, just like good banana muffins should be. But at the same time, they’re airy and cakey, and not too heavy on your tum. On top of all of that, they have no nasty ingredients. 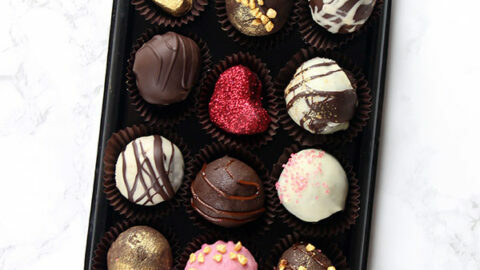 No wheat, no processed sugar, no oil, and no animal products! Yes, they are higher in fat due to the use of almond flour, but each muffin contains just 10g of (healthy) fats which I don’t think is too extreme when you compare it to regular muffins. 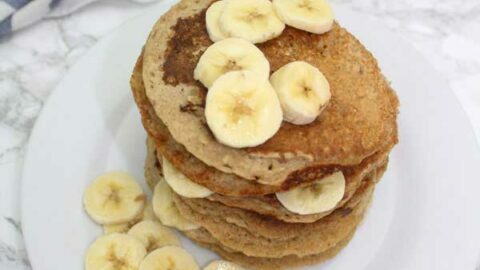 They are sweetened only with the bananas plus some apple sauce and agave nectar, and the almond flour makes them completely gluten-free! And with the exception of a flax egg, there are no other weird vegan baking substitutes required. These banana muffins are the perfect balance of moist and airy! As I’ve mentioned in a few of my other posts, flax seeds act as an egg replacer in vegan baking. 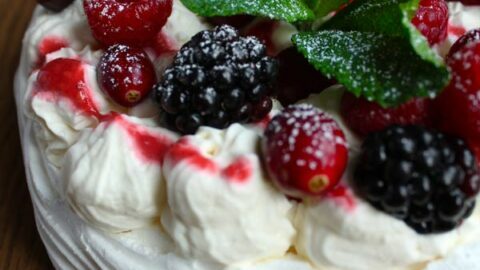 Mixed with water, they create a gloopy texture that helps the rest of the ingredients bind together when baking. This is also well-known as a flax egg. Set your flax egg aside for a few minutes. 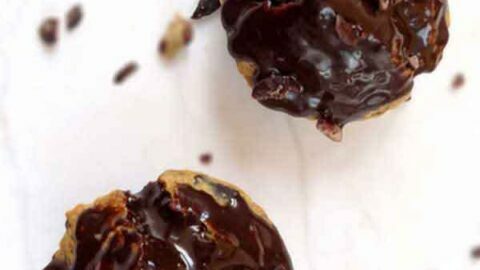 You’ll need some overripe bananas in order to make these muffins. And by overripe, I mean the ones that have brown spots all over them. Simply pop your bananas into the oven at 180C/350F for 5 minutes and they will come out with black skins. Let them cool for a few minutes before peeling and mashing! They’ll be a bit softer than regular overripe bananas but perfectly sweet! I used this trick when I made my vegan banana bread and it turned out great! Now it’s time to add in the flax egg from earlier, along with apple sauce, agave nectar (or maple syrup if you prefer), vanilla and a little bit of lemon juice. The great thing about sweetening banana muffins with apple sauce and agave nectar is that they are much lower on the glycemic index compared to regular muffins. 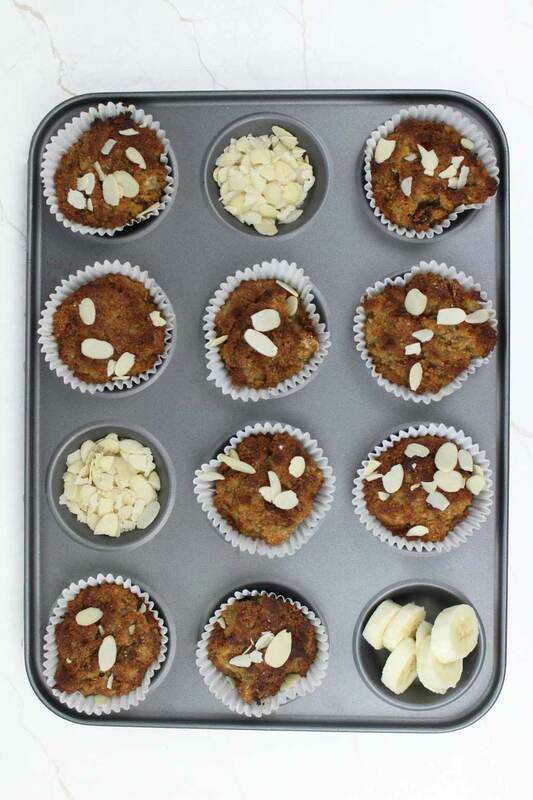 The three remaining ingredients for these banana muffins are almond flour, baking soda, and baking powder. 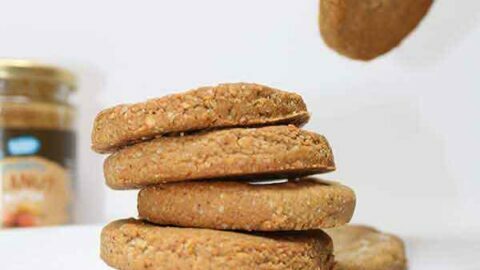 Because the almond flour can be quite heavy and dense, we want to lift it as much as possible. This is why we add the baking soda and powder, which helps to create a cakey texture. Just so you know, the batter for these muffins will be very thick and not at all like cake batter. The muffin mix will be thicker than a typical batter. Spoon your mixture into some muffin cases (you should get around 12) and bake for 30 minutes. A toothpick will come out clean once they’re ready. 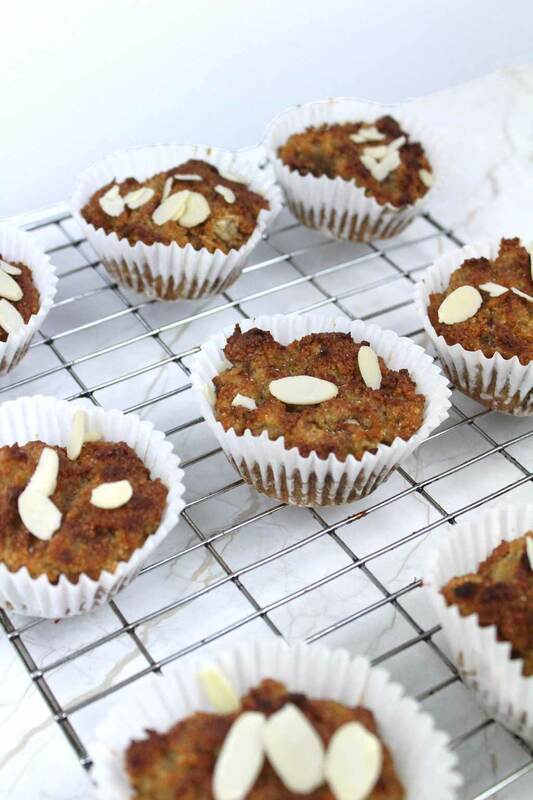 Yes, they’re a bit browner than your average muffin but that’s simply the almond flour! If you want to make them a bit lighter in colour, you could try substituting half of the almond flour for regular plain flour. 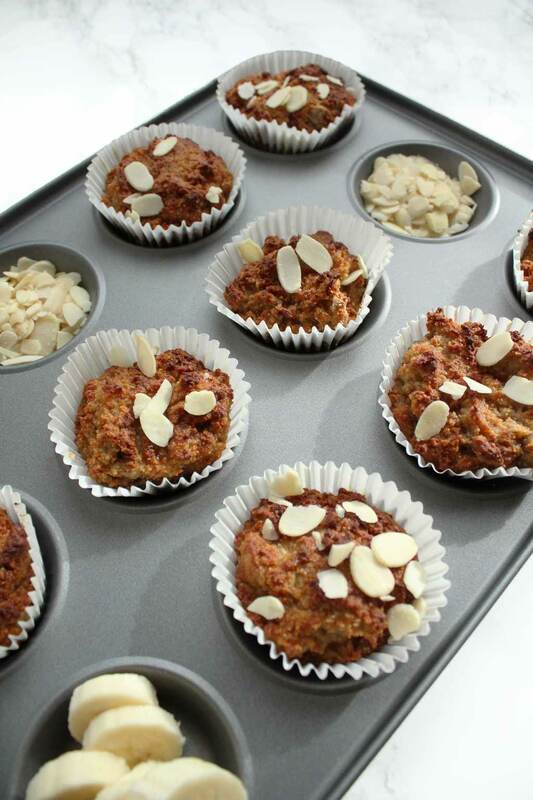 I chose to keep my muffins simple and just topped them with some flaked almonds. 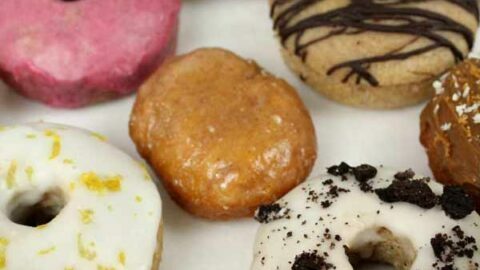 You could absolutely leave them as they are or even go a step further and add some glaze on top. 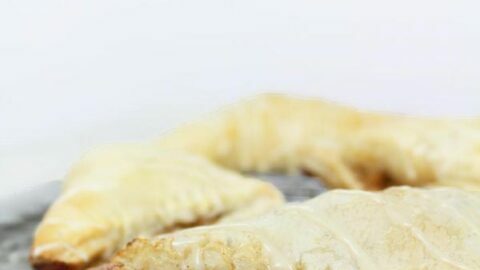 I hope you enjoy this recipe and if you give it a go, please let me know how it went by leaving a rating below! 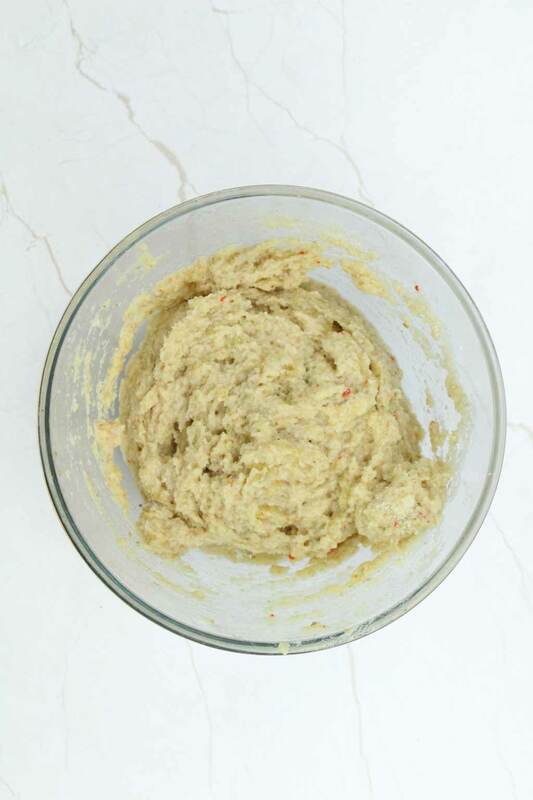 A healthy, vegan banana muffin alternative made with almond flour. Preheat oven to 200C/ 390F and line a tray with 12 muffin cases. 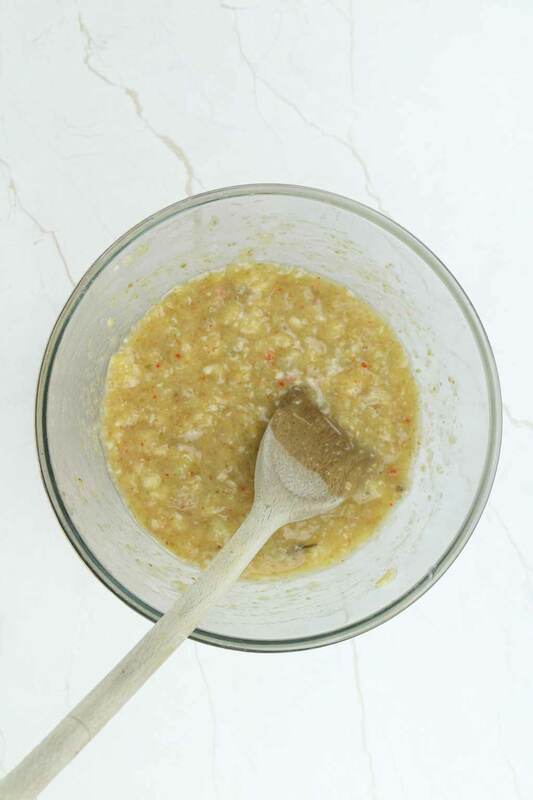 Mix the flax seeds and water together then set aside to thicken. Mash the bananas in a bowl using a fork. Add the apple sauce, flax seed mixture, agave nectar, vanilla, and lemon juice. Mix well. Add the baking powder, baking soda, and almond flour and mix again. The batter should be quite thick and gloopy. Spoon the mixture into the cases and bake for around 30 minutes. A skewer will come out clean when they are ready. **If your bananas aren't ripe enough, put them in the oven at 180C/ 350F for 5 minutes until they turn black. Then just peel and mash! 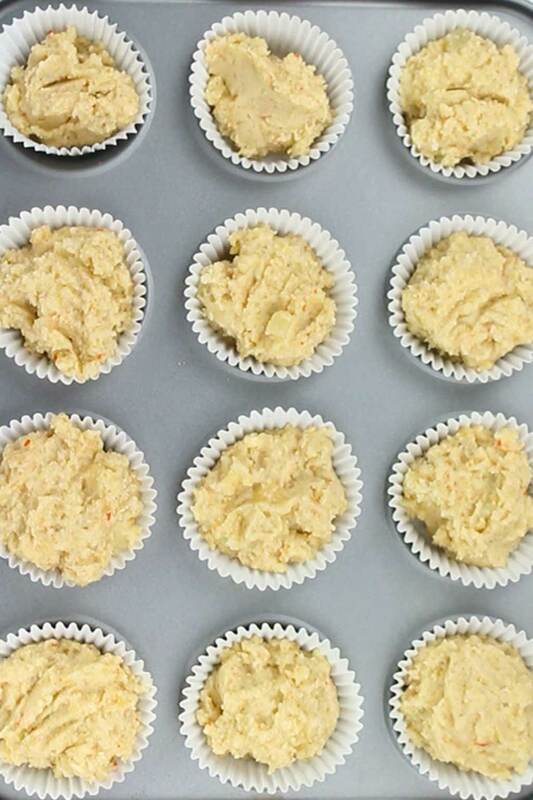 *Muffins can be stored in an airtight container for up to 5 days. Wow!! These are amazing! So moist and they certainly beat any shop bought muffin I have ever had. Thank you so much Fiona, that’s so kind! Glad you liked them!